A great deal of my ski-mountaineering experience has been gained under the guidance of Ruedi Beglinger, Owner and Operator of Selkirk Mountain Experience - Durrand Glacier Chalet. 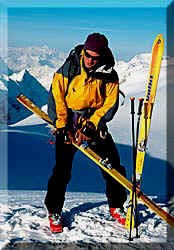 Without a doubt, Ruedi is the Best Ski Mountaineering Guide available. 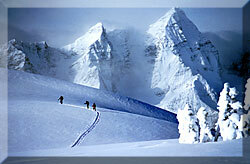 A week with Ruedi generally involves climbing 40,000+ ft., 3 peaks a day, icefall routes and steep, deep powder. 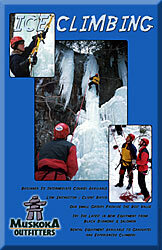 A large part of my ski-mountaineering portfolio has been compiled through Ruedi's cooperation. Dan Tricco's Epic Boards is a local Collingwood company that has specialized in the design and production of hand-crafted kite and wake boards. 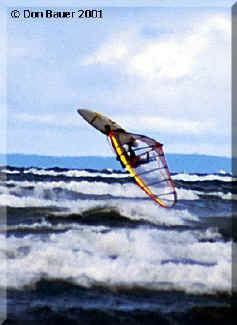 Dan's skill at board building is only surpassed by his ability to 'model' on the water for my photographs. Purcell Lodge was the first location my buddies Brad Belford, Stuart Jones and I went to for a week of backcountry skiing. Our 'avoidance' of the Spillimacheen River water hazard and extensive shin damage kept Paul and the other guests quite amused. We had our hands full, revelling in the awesome, deep powder. Following the visit, Paul was quite helpful in getting my gears moving towards a mountain lifestyle. Paul and his wife Ann were also excellent hosts two years ago when I introduced my wife Pat and our Kiwi friend Neville Mallett to backcountry skiing.